This weekend heralds a famous holiday for the life of a gardener - August 8th is "Sneak some Zucchini onto your Neighbor's Porch" day. With that holiday in mind, I've included a summer veggie stack as today's recipe. When I made this recipe, I used a combination of summer and pattypan squash, mainly because they are what I had on hand. Truth be told, the pattypan were a gift from a friend, who undoubtedly knows of this weekend's holiday! Any kind of summer soft skinned squash would work well in this recipe, along with any type of zucchini. Cook leeks and garlic in a microwave and oven safe baking dish until leeks become soft, about 1 minutes. Add chicken stock to the dish and heat until hot, about 30 seconds. 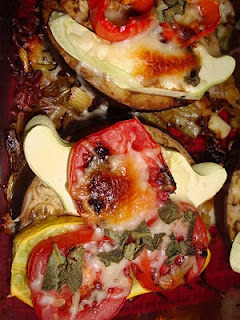 Arrange tomato, red pepper, zucchini, and eggplant in decorative stacks in the dish. Cook about 5 minutes, until the vegetables are cooked through. Top with a drizzle of olive oil, the Parmesan cheese and the fresh herbs. Put the cooking dish in a broiler and broil until the cheese melts. Stealthy Cooking Tip: This recipe brings out the fresh taste of fresh vegetables. Use the freshest ones you can find - from garden, farmer's market, or the grocer. That said, also use vegetables that you like! If you don't like eggplant, use more pepper. You'll notice that I've indicated either red pepper or tomato. That's because I have someone who likes red pepper, but dislikes tomato. You'll have better success eating your veggies if you serve ones that you like!